How important is social media marketing for an online business? Social media marketing is sharing the content on various platforms to promote a product or a service and use social media as a marketing tool. Simply, it is a process to gain traffic for your website or attention through social media. It is one of the important techniques in Digital Marketing. 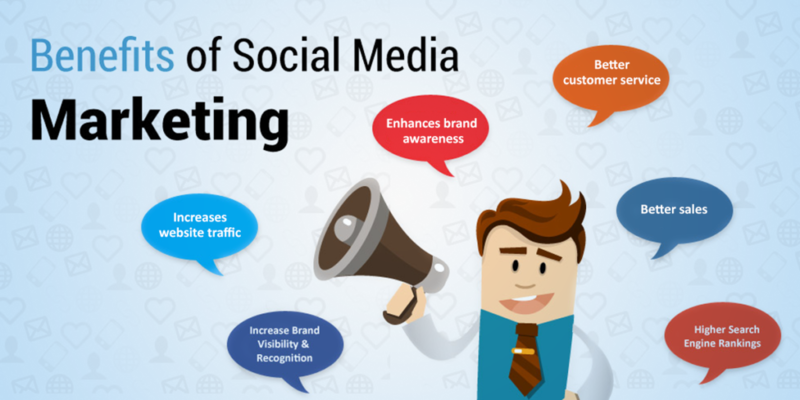 Social media marketing incorporates activities like posting text, image, videos, and other content that drives engagement, as well as paid social media advertising. There are many marketing techniques available. So you may think why my business requires social media marketing. The number of people spending time on social media networking sites is increasing drastically every year. Worldwide social media users are expected to reach around 2.95 billion by 2020. 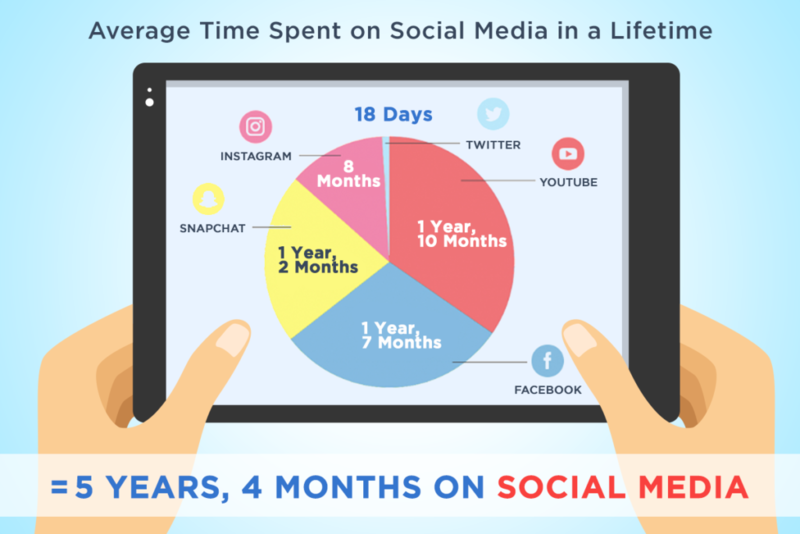 Stats show that the average person puts in more than five years of his or her life in social media. You should target where your customers are spending most of their lifetime so that you can focus on the same. With social media marketing, the online presence of your business will be improved. Social media marketing is an amazing way for organizations of all sizes to reach prospects and customers. Your customers might already be communicating with brands or organizations through social media, and if you are not speaking to your audience directly through social platforms like Facebook, Twitter, Instagram, and Pinterest, you are missing out! Great social media marketing can bring huge success to your business and can drive leads and sales. Promoting activities through social media by updating status or tweets, or blog posts. It is advisable to monitor social media pages in order to understand the needs of social media users and respond to them accordingly. You need to find out what people are talking about and what they are interested in. You can acquire these insights by analyzing social media data. There are many socila media monitoring tools available online that you can use to monitor social media data. Social Media Optimization often guides the public from social networking websites to the company website, where more information can be given. For instance, a campaign to raise awareness of a new automobile may direct the visitor to the company’s webpage providing information on where local dealerships are located and how to plan a test drive. Refer the below image for the benefits of the Social Media Marketing. Each one will be explained later in the article. The bigger and more engaged your audience are on social media networks, the easier it will be for you to achieve the marketing goals listed in your list. Customer service- Quick customer response time is not an option anymore! If there is a problem with your product or service, your customers anticipate you to solve it right away. This can be possible through social media. CRM- By integrating social media channels into CRM platforms, customers can interact with Organizations through their preferred channels. This can result in better customer service. Sales- Many customers use social media before making purchase decisions. You can influence the customer’s buying-decisions at multiple phases accross the sales funnel by: amplifying the reach, answering customer questions, addressing their pain points, encouraging buyers with coupon codes. Which items are they purchasing and why? What kinds of posts do they share? This little knowledge results in more Obvious Marketing Benefits. When you understand your customers, you can write better content and more convincing posts, which will lead to more traffic. But, the benefits can sometimes go long way beyond marketing, helping you identify customer’s pain points, improve sales conversions and even refine your product strategy. Social links may or may not boost the webpages position. But, social media profiles are often amongst the top results in search engine result pages for brand names. You might have noticed Facebook and Twitter profiles making their way into Search listings. There is a strong correlation between social activity and rankings. In the Past, social media user was able to post convincing content and effortlessly increase their social media following. After a few months, they use to receive loads of friend requests, comments, shares, and likes, all this was possible because of their amazing content. But today, that is not the case. In fact, most of the Social media platforms are making it progressively hard to build an organic following. And it is intentional. Here is the reason, As the capacity for organic superstars to sparkle goes down, something else goes up. Yes, you guessed it right! Ad spend raises! And we think that it raises only in Facebook. But the fact is that it is the same for every other social media platform. They make it more difficult for users to grow their own organic reach so that business spend more money on advertisements. In fact,for the one change that Facebook has made has caused 52% of drop in organic reach per post. Social Media is ending up more ‘pay to play’. As organic reach becomes more difficult, business have to pay to get noticed. They can no longer trust content marketing efforts to build a huge following. The more the social media algorithms prioritize advertisements, the more the Organizations are willing to pay. This is why social media Ad spend is increasing . Advertising budgets for social media multiplied from 2014 to 2016. It’s truely not surprising! It makes sense when you find out that social media companies make practically the major part of their monetary contribution from advertisements. In other words, social media is free for users only, because advertisers are paying lots of money to reach those users. The user is the product. But to reach them, you have to pay. Fortunately, if you pick the right social media platform for your business that you would like to invest into, then you will not be in problem. Most social media sites still have very sensible advertising costs, particularly if you have considered through your advertisements properly. After all, the better your ads are, the less you have to spend on them. It is a cost-effective way to extend your brand’s reach. If you play your cards right, you can get your content in front of a huge audience at a lower cost. Most of the social media platforms offer incredible targeting capabilities, which allows you to focus your entire budget on exactly the types of people that are most likely to be interested in your business. Social media ads can be customized according to your business needs. They allow targeting and re-targeting. Below are the two factors you should always keep in mind while advertising. Find the right platform – Look which platform suits your business best. Find the right targeted audience – Define your audience properly. If your ads are being shown to people who are not interested in your business, there will be no ROI for your campaign. Regardless of what you offer/sell or whom you sell it to, using social media as a marketing tool can help you grow your brand. Taking the Global Social media users into consideration, by playing it right imagine the popularity your brand can get. By using Social media marketing, your business can benefit in enormous ways. So, always make the best use of it.